Listen to "'Tis: A Memoir" on your iOS and Android device. Frank McCourt's glorious childhood memoir, Angela's Ashes, has been loved and celebrated by listeners everywhere for its spirit, its wit and its profound humanity. A tale of redemption, in which storytelling itself is the source of salvation, it won the National Book Critics Circle Award, the Los Angeles Times Book Award and the Pulitzer Prize. Rarely has a book so swiftly found its place on the literary landscape. And now we have 'Tis, the story of Frank's American journey from impoverished immigrant to brilliant teacher and raconteur. Frank lands in New York at nineteen, in the company of a priest he meets on the boat. He gets a job at the Biltmore Hotel, where he immediately encounters the vivid hierarchies of this 'classless country,' and then is drafted into the army and is sent to Germany to train dogs and type reports. It is Frank's incomparable voice -- his uncanny humor and his astonishing ear for dialogue -- that renders these experiences spellbinding. When Frank returns to America in 1953, he works on the docks, always resisting what everyone tells him, that men and women who have dreamed and toiled for years to get to America should 'stick to their own kind' once they arrive. Somehow, Frank knows that he should be getting an education, and though he left school at fourteen, he talks his way into New York University. There, he falls in love with the quintessential Yankee, long-legged and blond, and tries to live his dream, But it is not until he starts to teach -- and to write -- that Frank finds his place in the world. The same vulnerable but invincible spirit that captured the hearts of listeners in Angela's Ashes comes of age. 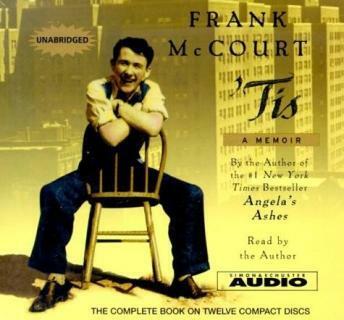 Frank McCourt's 'Tis is one of the most eagerly-awaited audiobooks of our time, and it is a masterpiece. Having previously read and enjoyed Angela's Ashes by Frank McCourt, I thought this book was even better! Quick, easy read. Very well written and gave a lot of insight into the author's life. Very humorous too! Tis, the sequel to Angela's Ashes, falls a tad short of the genius found in the first book. With that said, Tis still deserves a "recommend highly" review. McCourt's story contains raw emotion and powerful human experieinces all interlaced with his wry sense of humor. The author also provides listeners with a special treat as he personally narrates the book in his rich but easy going Irish brogue. If you liked Angela's Ashes, you will also enjoy Tis. I suggest that you read the autobiographical stories in order, Angela's Ashes and then Tis. Although I can't argue that Frank McCourt is an exceptional writer, and I thoroughly enjoyed listening to his voice, I found this book a bit depressing, and wished I had rented the abridged version, instead of the 12 unabridged CDs. It seems that whenever Frank desired and worked very hard for something (a better job, an education, a girl), he seemed never satisfied with what he had. It just went on and on with many unhappy experiences, and only a few snatches of humor and happiness. I'll have to think long and hard before I decide if Angela's Ashes is worth my time. The author transports you into his world, fraught with difficulties and mini-triumphs. His narrative is often funny and irreverent, at times seems sad but unsentimental... read in his delicious accent it was an absolute delight. Heard alot of good things about Frank McCourt and his writing, but I just couldn't get through all the swearing. It started off with a trickle and then turned into a deluge. Got to a point where I couldn't stand it any longer. After listening to Angela's Ashes and appreciating the life, dreams and humor of Frank McCourt seeking a better life in America's promised land I was eager to download 'Tis to learn where Frank's life adventures took him. He is a remarkable individual with a keen storytelling way about him. I thought this was very funny...so much better than book 1 that he wrote. I highly recommend this book.